When we think of human trafficking, we tend to think it happens in countries far away from our own. It takes places in third world countries where their laws aren’t as strict or their law enforcement is not as effective. We seldom think that human trafficking is a serious problem right here in the United States. It’s hard to fathom that it can even happen right here in our own backyard. Later in the month, President Trump held a meeting regarding domestic and international human trafficking. 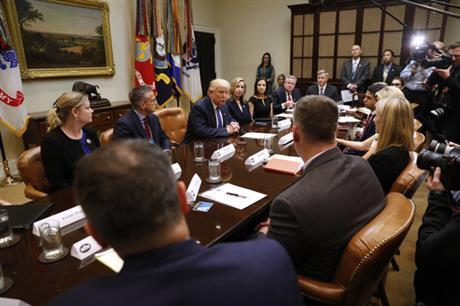 During the meeting, President Trump stated that he wanted to bring “the full force and weight” of the U.S government to fight the “epidemic” of human trafficking. President Trump also stated in the meeting that human trafficking is a problem that is “not talked about enough.” He then instructed his Justice Department and Homeland Security to reevaluate the resources they had to combat the human trafficking problem in the United States. On February 9th, President Trump signed an Executive Order titled “Enforcing Federal Law with Respect to Transnational Criminal Organizations and Preventing International Trafficking.” The purpose of the order was to instruct the Justice Department to begin focusing on cracking down on drug cartels and other illegal organizations. Within the first two paragraphs the order states: “Likewise, the trafficking and smuggling of human beings by transnational criminal groups risks creating a humanitarian crisis.” The order went on to state that all federal law enforcement will determine what resources they need to combat human trafficking, as well as develop strategies to combat the epidemic. Since President Trump took office, he has maintained a hard stance on human trafficking. Meanwhile, the main stream media has mostly ignored the work of President Trump and focused on other ancillary issues. In one short month, the number of human trafficking arrests soared to 1,500. Compare that to only 400 in the entire year of 2014. That’s a staggering increase in such a short time frame. Along with many other promises, President Trump made a promise to go after those who abuse human life. Take for example his recent airstrikes on Syria. President Trump maintains that he has no interest in going into a full-fledged war with Syria, but when he saw images on children being gassed he knew he had to act. His promise to go after those who abuse human life is being fulfilled as he continues to take hard action against those who engage in human trafficking. So the question remains, why does such bold action go unnoticed? A problem that is clearly plaguing our cities and states is mostly ignored by those in the main stream media. It could be argued that the media has no interest in showing the good deeds of President Trump. Such good publicity does not fit the narrative that President Trump is “monster” who can’t be controlled. Regardless, whether you are Left or Right, we should pause to applaud the President’s actions on this issue. Especially during this month where we focus on the issue of human trafficking. The issue of human trafficking is not solely a foreign issue, but also a domestic issue. It’s an issue that exists in the shadows of our own society. It is comforting and reassuring to know that the President is acting on this issue and taking bold action.